Shimmer and shine with these sterling silver half hoop earrings covered with sparkling crystals. 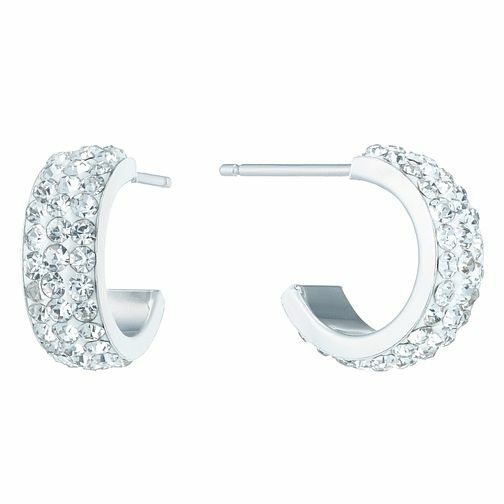 Sterling Silver Crystal Encrusted Half Hoop Earrings is rated 3.7 out of 5 by 3. Rated 5 out of 5 by Anonymous from This product is so beautiful. The product is amazing, they are stoned beautifully and are a perfect size for everyday wear. They don’t bend, rust or damage easily, I’ve bought 2 in perfect condition. Rated 1 out of 5 by Anonymous from Rubbish Gorgeous looking earrings but they went black on the inside very quickly and then one snapped after a few weeeks so I binned them.